HAVE YOU SCHEDULED YOUR TRANSITION CALL WITH VIZIENT YET? If you intend to transition to the Vizient PTN (and we hope you do), you must have a transition call with VCSQI and Vizient staff. These calls are only 30” in length and will review your practice’s TCPI status with Vizient to assure a smooth transition for your continuing participation in the national project through next September. This is a continuationof your work; you are not starting over. Even if you have completed all 5 phases working with VCSQI, we encourage you to transition to Vizient for continued support in participating in the Quality Payment Program (MIPS guidance), to be recognized by CMS at the end of the project, and to have access to quality improvement coaching from the Vizient experts. To learn more about Vizient, please listen to this recording here of the November 1 recording of a presentation by Vizient. The slides shown in the presentation can be viewed here. Webinar Monday: Physician Medicare Fee Schedule Final Rule — Understanding 3 Key Topics — November 19, 2 – 3:30 pm ET Register here. Each class addresses a group of milestones along common themes. 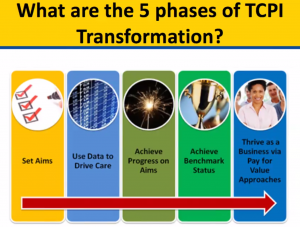 The TCPI Project for primary care clinicians includes 27 milestones and for specialists, 22. Congratulations Again to 19 Practices Completing 5 Phases of TCPI with VCSQI! Grigor M. Harutunian MD Inc. The Centers for Medicare & Medicaid Services (CMS) updated its Quality Payment Program Participation Status Tool based on calculations from the second snapshot of Medicare Part B claims data to calculate the Alternative Payment Model (APM) entities threshold scores. The second snapshot are for dates of participation between January 1 and June 30, 2018. As a reminder, the tool includes 2018 Qualifying APM Participant (QP) and MIPS APM status. By the end of this year, CMS will release the third QP and MIPS APM status data based on snapshots of claims between January 1, 2018 and August 31, 2018. To learn more about how CMS determines QP and MIPS APM status for each snapshot, please view the QP Methodology Fact Sheet. The Centers for Medicare & Medicaid Services (CMS) has moved Quality Payment Program (QPP) resources from CMS.gov to the newly redesigned Quality Payment Program Resource Library on qpp.cms.gov. Following feedback from clinicians and others in the health care community, we wanted to make Quality Payment Program information and resources available in one place. We’ve also made it easier for you to find the resources you’re looking for by including a search function that allows you to search for resources by year, reporting track, performance category, and by document type (e.g., fact sheet, user guide, measure specifications). 2018 MIPS Participation Information Webinar: In case you missed the recording held in April, here is a link for more information for a better understanding of MIPS for 2018 – Click Here. Once you complete your EIDM account registration, you will receive an e-mail acknowledging your successful account creation with your EIDM User ID. Use your unique EIDM User ID and Password to login to the Quality Payment Program Portal. CMS encourages you to create an EIDM account or verify your EIDM credentials now to prepare for your 2018 MIPS data submission. CMS has updated the Quality Payment Program website so individual eligible clinicians who choose to submit their Quality performance category data via claims can access performance feedback for the 2018 performance year on an ongoing basis. If you are participating in MIPS as an individual clinician and you have chosen to use claims to submit Quality performance category data, you attach quality data codes (G-codes) to your claims throughout the 2018 performance year. Those who have been doing so can now login to the Quality Payment Program website and review their performance feedback, which will be updated on a monthly basis. When you submit your quality data to CMS through your claims, they’ll be processed to final action by the Medicare Administrative Contractor (MAC). The last day for submitting 2018 claims with quality data codes for the 2018 performance period is determined by your MAC, but data must be submitted on claims with dates of service during the performance period and must be processed no later than 60 days after the close of the performance period. Please check with your MAC for this guidance. As a reminder: claims-based quality measures are calculated automatically by CMS based on the quality data codes submitted on your 2018 claims. Claims data submission is only an option for Year 2 (2018) if you’re participating in MIPS as an individual (not as part of a group). For more information about submitting your Quality performance category data via claims, review the 2018 Claims data submission fact sheet. 2018 Improvement Activities Performance Category CME Module: Covers the basics of the MIPS Improvement Activities performance category including reporting requirements, scoring, and flexibilities for small and rural practices. 2018 Cost Performance Category CME Module: Offers an overview of the MIPS Cost performance category and how CMS calculates Cost scores. 2018 MIPS APM CME Module: Provides an overview of MIPS APMs, the APM scoring standard, and reporting requirements for MIPS APM participants. 2018 Quality Payment Program Participation Infographic: Explains how eligible clinicians can participate in the Quality Payment Program for the 2018 performance year. 2018 MIPS Data Submission Infographic: Reviews how MIPS eligible clinicians can submit data for the 2018 performance year. 2018 MIPS Scoring 101 Guide: Provides a detailed overview of how each MIPS performance category is scored, how CMS calculates bonus points, and how the payment adjustment is calculated based on the MIPS final score. On November 1, 2018, the Centers for Medicare & Medicaid Services (CMS) issued a final rule that includes updates to payment policies, payment rates, and quality provisions for services furnished under the Medicare Physician Fee Schedule (PFS) on or after January 1, 2019. The calendar year (CY) 2019 PFS final rule is one of several final rules that reflect a broader Administration-wide strategy to create a healthcare system that results in better accessibility, quality, affordability, empowerment, and innovation. The Centers for Medicare & Medicaid Services (CMS) has published the 2019 CMS Quality Reporting Document Architecture (QRDA) Category III Implementation Guide (IG), Schematron, and Sample files. The 2019 CMS QRDA III IG will help eligible clinicians and eligible professionals report electronic clinical quality measures (eCQMs), improvement activities, and/or promoting interoperability measures for the calendar year 2019 performance period. You can find additional QRDA related resources, as well as current and past IGs, on the Electronic Clinical Quality Improvement Resource Center. For questions related to the QRDA IGs and/or Schematrons, visit the ONC QRDA JIRA Issue Tracker. Visit the VCSQI website and see more resources and information in the sidebar of tabs on the right. Learn how VCSQI SAN 2.0 will help your practice transform in the new Quality Payment Program.